A site unto itself, the Corpus Christi Watergardens Fountains truly are a beauty to behold. 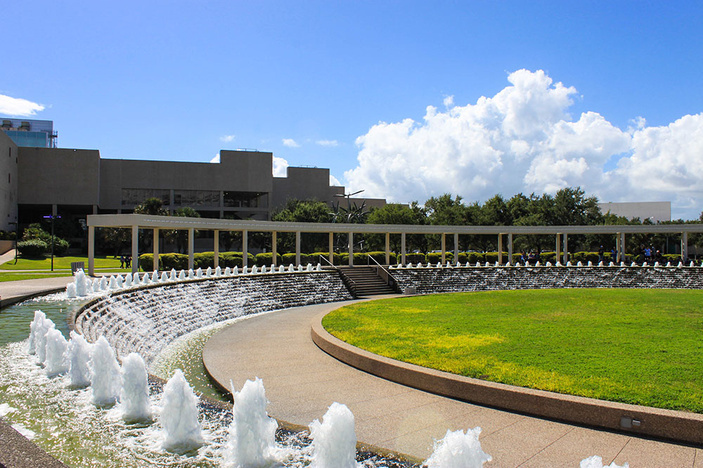 Situated in the entertainment district downtown, the fountain is surrounded by the Art Museum of South Texas, the Harbor Playhouse, the Corpus Christi Historical Museum, and the American Bank Center. To call it a fountain does not do it justice. The Bellagio-style water extravanganza encircles a large green area perfect for relaxing in the cooling spray and tranquil sound of rushing water. It’s also a prime spot for weddings and other celebrations. Local actors from the Harbor Playhouse are often spotted studying their scripts in the serene atmosphere. Still, others like to use the tranquil ambiance as a place to do their morning yoga. The Watergardens Fountain is maintained by the city of Corpus Christi’s parks department, which keeps the waters running 8 a.m.-6 p.m. daily unless under extreme drought conditions or during its yearly maintenance. An almost month-long cleaning usually takes place just after the Christmas holidays in January. When the waters are running, the city asks that no coins be tossed in this fountain. The four large pumps cycling water through the Watergardens Fountains are not set up to filter coins. Consider yourself lucky just to be there and keep those coins in your pocket!